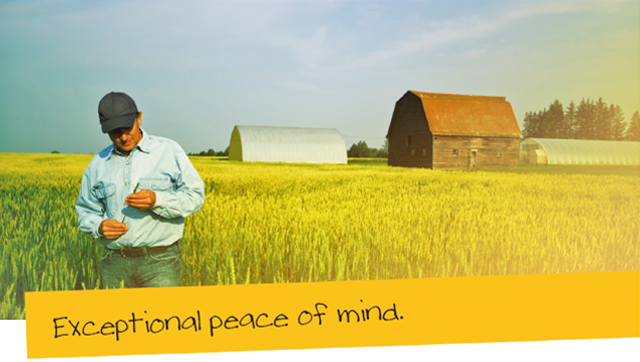 Farmers Union Insurance’s Farm and Ranch Policy offers you exceptional peace of mind. It provides complete, cost-effective protection for most farm loss situations. You can customize your coverage to fit your specific needs. Your North Dakota farmers insurance policy from Farmers Union protects your farm operation from perils including fire and lightning, wind and hail, explosion, aircraft and vehicle damage, smoke damage, theft, vandalism, overturn and collision. Your dwelling is also covered for glass breakage; damage from falling objects or the weight of snow and ice; collapse of a building or part of a building; frozen plumbing, heating and air conditioning, and accidental damage from artificially generated electrical current. We cover your main dwelling and all additions, as well as other farm structures – additional dwellings, barns, buildings, sheds, structures and permanent fixtures. We also cover materials and supplies on the premises to be used for construction or repair of insured buildings. Your household personal property owned or used by an insured is insured while it is anywhere in the world. We cover farm machinery and implements, usual to the operation of your farm. Farm implements are covered while within the state of North Dakota or 100 miles into the bordering states. Livestock is covered throughout North Dakota and within 100 miles outside its borders. Harvested crops stored on your farm can be covered; claims are paid on market value at time of loss. Covers tools, machinery, livestock, feed supplies, hay, seed and grain, and portable structures. Special limits for business property on and off the residence premises. $10,000 limit for borrowed farm machinery and implements. $250,000 limit for replacement or newly purchased farm machinery or implements – 30 days coverage. 5% of the limit of insurance for debris removal on Coverages A, B, and F, limited to $500 per loss on Coverages D, D1, D2, and E.
$10,000 limit for pollution clean up and removal (on premises name peril coverage only). 20% limit of Coverage A or Coverage F for buildings under construction – 60 days coverage. $1,000 limit for outdoor antennas. $2,000 limit for farm operations records. Additional operating expense limited to 1% of the combined total of Coverage D and Coverage E.
+ Fire department service charge. + Credit card, fund transfer card, forgery and counterfeit money. + Refrigerated and frozen products. + Farm machinery glass breakage. + Sump pump coverage (dwellings covered under Coverage A). + Freezing or smothering of livestock. + Satellite dish and/or television antenna.